The Army got a little help from its friends last week as it works to hone its fighting abilities in extreme cold weather. More than two dozen experts, including service members from England, Finland, Canada, Chile, Germany and Nepal, spent the week with soldiers from U.S. Army Alaska talking about tactics, techniques, procedures and cold-weather equipment during the Cold Regions/Military Mountaineering Collaborative Training Event. The four-day event was hosted by U.S. Army Alaska at the Black Rapids Training Site, home of the Northern Warfare Training Center. Also attending were troops from the Marine Corps Mountain Warfare Training Center, the 5th Ranger Training Battalion, 1st and 10th Special Forces Groups, and the Alaska National Guard. "This exchange, of how our peers conduct training, just makes us better," said Lt. Col. Mick Braun, commandant of the Northern Warfare Training Center. "In Nepal, they operate in altitudes a lot higher than what we have here. In Finland, the temperatures probably get much colder. It's this knowledge that makes us better." The relationships and partnerships built also could mean more opportunities for U.S. soldiers to train at partner nation schools and vice versa, Braun said. Lt. Col. Thomas Salberg, of Great Britain's 24 Commando Engineer Regiment, agreed. "We're very much keen to make the most of this opportunity, to continue to share," he said. "There's no point in us individually learning lessons our partners have already learned." In recent months, the Army has been stepping up its cold-weather training, including dropping paratroopers and deploying Stryker vehicles north of the Arctic Circle for various exercises. The training gives U.S. Army Alaska's Stryker and airborne brigade combat teams the chance to exercise their rapid deployment capabilities and demonstrate the Army's ability to operate in extreme cold weather. It also comes at a time when Russia is building its presence in the Arctic. Russian Defense Minister Sergei Shoigu told Russian news agencies in October that one of its military units will be permanently stationed in the Arctic by 2018, according to the Associated Press. He also said Russia is building several new bases in the Arctic as well as rebuilding six Soviet-era air bases there, the AP reported. On Friday, Shoigu said the Russian defense ministry delivered 9,500 metric tons of equipment and materials during last year’s brief navigation season as part of its effort to build military facilities on Wrangel Island and Cape Schmidt in the Arctic region, according to the Associated Press. The military also will focus on deploying top-of-the-line air defense missile systems across Siberia, he said. 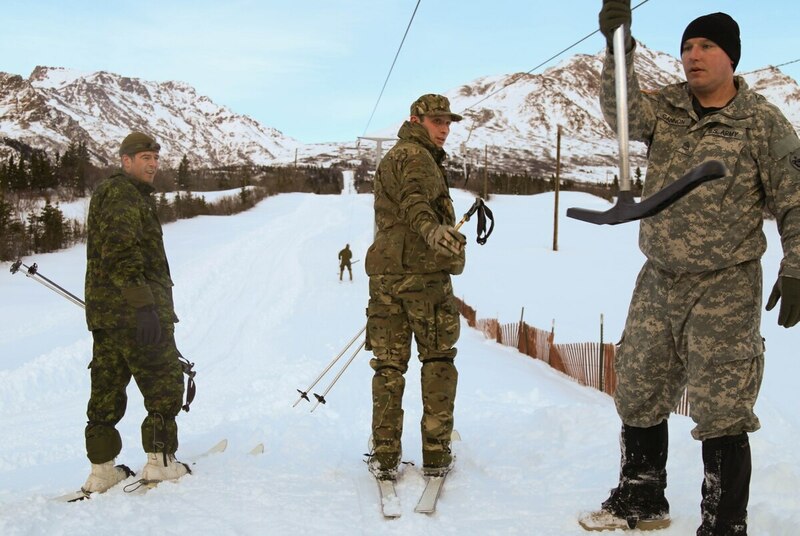 Military mountaineering and cold weather professionals exchange ideas and opinions on a beta version of skis and bindings being developed by U.S. special operations troops. U.S. Army Alaska hosted two dozen attendees, representing nine countries, for the Cold Regions/Military Mountaineering Collaborative Training Event in Alaska. For the U.S. and its partners, sharpening the ability to fight in the Arctic – or any place with extreme cold weather – is critical because of the unique challenges of operating and surviving when the temperatures drop below zero. "We have to fight with two enemies, the environment and the opponent," said Italian Col. Alberto Zamboni, deputy director of the NATO Centre of Excellence for Mountain Warfare. "We have to learn to use the environment as a friend, not as an enemy, and that takes a lot of knowledge. That takes a lot of experience in different environments, different climates." 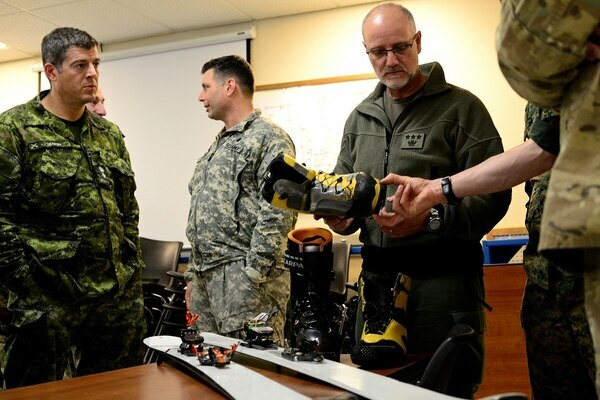 For the Canadian military, the event was a chance to learn about mountaineering in extreme cold, said Lt. Col. Francois Caron of the Canadian Army Advanced Warfare Center. "From a Canadian perspective, our cold weather program is pretty much our bread and butter five, six months of the year," he said. "We’re used to high Arctic and sub-Arctic conditions. But our mountain program is in its infancy, so we’re developing it and capitalizing on the strengths of our partners who live in the mountains most of the time." Each country faces different challenges, but bringing together all the lessons learned "could be the difference between life and death," Zamboni said. Even something as simple as what type of gloves or boots a soldier chooses to wear makes a difference, he said. "We don’t want our soldiers to be in trouble," he said. "The opponent should be enough to deal with. The environment should be your friend." 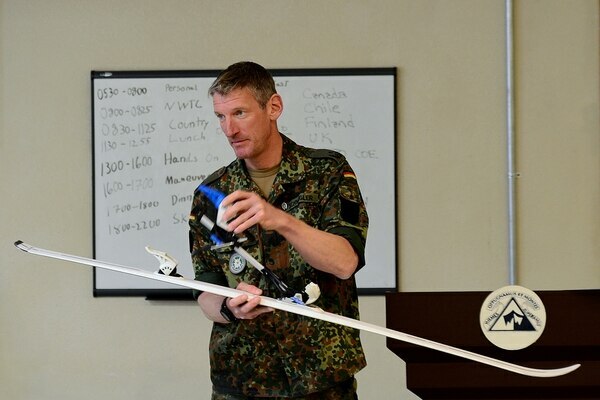 German Lt. Col. Johannes Schwegler demonstrates a set of skis, boots and bindings currently being used by the German Army. Schwegler was one of 24 attendees at the Cold Regions/Military Mountaineering Collaborative Training Event at the Northern Warfare Training Center's Black Rapids Training Site. Soldiers operating in extreme cold quickly learn that they can’t touch exposed metal with their hands, Salberg said. There’s very little usable water, and the equipment is bulky and heavy. "All these extra considerations make it just a far more difficult environment to move in, much less fight in," he said. In addition to small group discussions and presentations on topics such as maneuver techniques and operating in extreme environments, participants in the four-day event got out in the snow for some skiing, snowshoeing and snow machining. They also worked on setting up Arctic tents and trying out each other’s cold-weather gear. "There is no one solution in terms of keeping your hands warm or keeping your feet warm or keeping your boots on skis," said Lt. Col. Alan Brown, a spokesman for U.S. Army Alaska. "We’ve seen five or six unique solutions to gloves and boots and ski bindings just over the course of the last three days. That’s something that’s going to merit a closer look in the future." Take gloves, for example, Brown said. The U.S. Army typically uses a two-layer glove, one with a wool liner and a thicker outer shell, while the Finns use a three-layer glove that can be mixed and matched for temperatures colder than 40 degrees below zero, he said. "When it comes down to it, when we go jump into Deadhorse [north of the Arctic Circle], our biggest enemy is the weather," Brown said. "We have to make sure every soldier who goes up there, for contingency missions or search and rescue or just an exercise, we have to make sure we’re protecting our soldiers." This was the second time U.S. Army Alaska has hosted such an event, Brown said. "We realize our partners have a lot of expertise, and the amount of sharing and relationship-building that happens is one of our main goals here," he said. "There’s a lot of goodness, and we hope to get out of this [more] subject matter expert exchanges and future training events as we move forward."